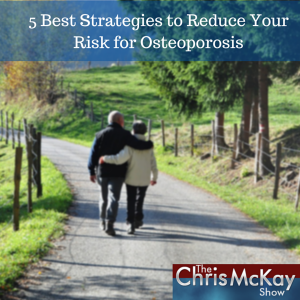 Chris talks about bone health and shares 5 of the very best strategies to reduce your risk for osteoporosis. Imagine if you could look through the walls of your house and see the structure, supports and studs that hold it all together and keep the roof over your head. Now imagine your reaction if what you saw was a weak frame ready to break at any moment and bring the walls down all around you. Obviously you would be concerned and you would want to do something. Well, what if I told you the same thing might be happening to your bones? It’s estimated that close to  54 million Americans have low bone density or Osteoporosis- yes, I said 54 million! In fact, studies suggest that approximately one in two women age 50 and older will break a bone due to this silent disease. And, this disease doesn’t just affect women- statics show that up to one in four men will develop osteoporosis as well. May is National Osteoporosis Prevention and Awareness month and it’s the perfect time to talk about this debilitating disease that affects a large portion of the population and causes bones to become weak and brittle. If you’ve ever seen a honeycomb you can imagine what a cross section of bone might look like for someone who has osteoporosis. In fact, the word Osteoporosis literally means “porous bone.” If you were to look through a microscope you would see large pockets of air, where bone should be. These pockets or holes compromise the integrity and strength of your bones. When your bones are brittle it doesn’t take much to break them. A fall or even something as simple as sneezing, coughing or bumping into the kitchen table could lead to a break and serious health complications including disability and in some cases even death! So what causes this to happen, how do our bones become so brittle? Well, you may be surprised to learn that it has to do with a process going on inside you right now. You see, despite a common misconception that bones are lifeless they are  like the rest of you, alive and constantly growing. 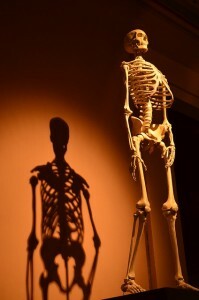 Your bones are regenerating all the time and as old bone cells dissolve away, new bone cells grow to take their place. In fact, every ten years or so, most of your skeleton is entirely replaced! However, if you know what to look for, you can take steps to reduce your risk of developing Osteoporosis. Here are 5 of very best strategies for reducing your risk and supporting strong, healthy, bones. Talk to your doctor about your risk for developing Osteoporosis and when you should have a bone density test. Osteoporosis is a disease that affects both men and women and if you’re over 50 or postmenopausal you’re in the right age group to start talking with your doctor about it. ● …Your weight because  A low body weight is associated with low bone mass and an increased risk of fractures. It’s been shown that a lack of exercise and a sedentary lifestyle can decrease bone density contributing to the development of osteoporosis. Even simple things like walking, swimming or lifting weights can help strengthen your bones. Also, If you have the opportunity to do any of these activities outside you can take advantage of your time in the sun to get some vitamin D (which has been shown to help support strong bones)! Cigarette smoke generates huge amounts of free radicals that attack and overwhelm the body’s natural defenses. The result is a chain-reaction of damage throughout the body — including cells, organs, and hormones involved in keeping bones healthy. Chronic heavy drinking has also been associated with many serious health problems, including osteoporosis. Two of the best things you can do to reduce your risk of developing osteoporosis are to quit smoking and abstain or reduce your consumption of alcohol to moderate levels. Generally, the biggest factor in the development of Osteoporosis is a diet that lacks proper nutrition. As you may know, calcium, and other nutrients like vitamin D are critical for your body to support healthy, strong bones. But getting enough of these nutrients from your diet can be a real challenge these days. Adding leafy green foods like kale, Swiss chard, collard greens, broccoli and brussel sprouts to your diet will help but it still may not be enough – plus, I’m not a big fan of eating swiss chard or brussel sprouts. The National Institutes of Health points out  we only absorb about 30% of the calcium found in foods… which leads us to the final important strategy for reducing your risk of osteoporosis and supporting strong, healthy, bones. And the last point is, you absolutely need to take a high-quality calcium supplement every single day. 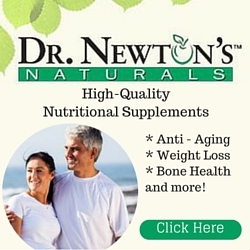 And, one that Chris recommends is a supplement called, CalMax® by Dr. Newton’s Naturals. CalMax® is the ultimate, all-in-one supplement solution for your bones, plus it helps your muscles, heart, managing stress and preparing your body for its best rest. CalMax® is a high-quality, versatile, drinkable supplement with magnesium, calcium, and vitamin C. And, each serving supplies your body with a 2:1 ratio of calcium to magnesium often recommended by doctors. And, the best part is since CalMax® is in an effervescent drink, it gets absorbed into your bloodstream fast so you feel relief quickly. 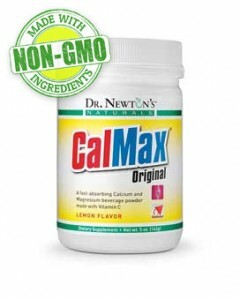 Get your own can of CalMax® by Visiting Our Sponsor Dr. Newton’s Naturals. National Osteoporosis Foundation What is Osteoporosis? The Journal of Nutrition Bone, Body Weight, and Weight Reduction: What Are the Concerns?